E. coli are commonly used to store and replicate plasmids of all types, but beyond that, researchers also use bacteria like E. coli and their relatively well understood biology to answer many interesting questions. 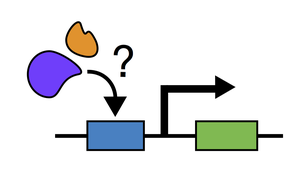 Does my transcription factor bind to a particular sequence? 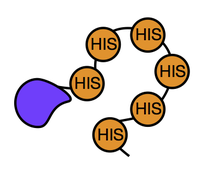 Do these two proteins interact? What happens when I overexpress this enzyme at a particular point in bacterial growth? Can I produce large amounts of this protein and study it in vitro? These, in addition to many questions about bacteria themselves, can be answered using model bacterial systems and plasmids avaliable at Addgene. Read below and browse our curated collection of bacterial expression systems to find out more! Although overexpressing or knocking down a gene can tell you much about its function and/or alter cellular activity in a way that’s interesting from an applied perspective, sometimes it’s best to delete genes from or introduce new genes and mutations to the bacterial genome itself. Manipulating the genome directly can give you more subtle control over protein expression and activity thereby limiting the use of cellular resources required for the production of large amounts of protein or high copy number plasmids. Whether you're studying the basic biology of a bacterial gene or redirecting metabolic pathways to produce a therapeutic compound, there are many different ways to alter bacterial genomes. From recombineering to CRISPR, this collection contains a variety of tools to help you harness bacterial genomes for your research. pCas9 42876 CRISPR Luciano Marraffini Bacterial expression of Cas9 nuclease gRNA. For a more comprehensive list of our bacterial CRISPR plasmids, see here. pwtCas9-bacteria 44250 CRISPR Stanley Qi Anhydrotetracycline inducible expression of wild-type Cas9 from S. pyogenes for inducing double stranded breaks. For a more comprehensive list of our bacterial CRISPR plasmids, see here. pgRNA-bacteria 44251 CRISPR Stanley Qi Expression of customizable guide RNA (gRNA) for bacterial gene disruption or knockdown. For a more comprehensive list of our bacterial CRISPR plasmids, see here. pGRG Series Various Plasmids Tn7 Transposition Nancy Craig A gene of interest cloned into one of these plasmids can be transposed into the attTn7 attachment site found in many enterobacterial genomes. The bacteria of interest are transformed with the appropriate construct, grown at the permissive temperature (32°C) to allow transposition, and the construct is then cured by growing at the non-permissive temperature (42°C). Transposition is efficient enough that selection is not required. pET-HIS-Sangamo 40786 TALEN Gang Bao Gateway cloning and expression of an N-terminally His-tagged TALEN fused to an E. coli codon optimized FokI endonuclease domain. pET-Sangamo-His 40787 TALEN Gang Bao Gateway cloning and expression of a C-terminally His-tagged TALEN fused to an E. coli codon optimized FokI endonuclease domain. If you’d like to know where your protein or RNA ends up when it's expressed, you’ll likely need to tag it with something that makes it easy to see or easy to blot. The plasmids in this collection contain fluorescent protein tags whose localization you can monitor in live cells (beware of artifacts! ), photoactivatable tags for super resolution imaging, epitope tags like His for easy western blotting or staining, and RNA transcript tags to monitor RNA localization. Using these plasmids you’ll hopefully get a better understanding of what your gene of interest does when expressed in vivo. Empty Backbones with Fluorescent protein tags Various Plasmids Blue/UV, Cyan, Green, Yellow, Orange, Red, Far-Red, Near-Infrared, Large Stokes Shift, Photoactivatable, Photoconvertible, and Photoswitchable fluorescent proteins Various PIs Fluorescent protein fusion: contains empty vectors with N and C-terminal fluorescent protein tags that can be used to create fluorescent protein fusions with your protein of interest. See an overview of Addgene fluorescent protein resources here. pCyPet-His 14030 FRET Patrick Daugherty FRET: Vector for arabinose inducible expression of an N-terminally His-tagged cyan fluorescent protein variant (CyPet) optimized for FRET measurements with a yellow fluorescent protein variant (YPet) found in pYPet-His. pYPet-His 14031 FRET Patrick Daugherty FRET: Vector for arabinose inducible expression of an N-terminally His-tagged yellow fluorescent protein variant (YPet) optimized for FRET measurements with a cyan fluorescent protein variant (CyPet) found in pCyPet-His. pRSETa mEos2 20341 mEos2 (fluorescent protein) Loren Looger Photoactivable Fluorescent Protein Expression: contains mEos2 with an N-terminal His tag. Photoactivable fluorescent proteins like this one can be used in super resolution microscopy. pZE31ms2 25860 MS2 coat protein binding sites Philippe Cluzel RNA localization: Contains a 2x array of the binding sequence for RNA-binding protein, MS2. Can be used in combination with a fluorophore-tagged MS2 (such as that found in pZS*12-MS2-GFP) to track RNA localization of your gene of interest once its appropriate cDNA has been fused to the MS2 binding sites within this plasmid. pZE31-DsRed-ms2x2 26248 MS2 coat protein binding sites Philippe Cluzel RNA localization: Contains a 2x array of the binding sequence for RNA-binding protein MS2 fused to dsRED. Can be used in combination with a fluorophore-tagged MS2 (such as that found in pZS*12-MS2-GFP) to track RNA localization of your gene of interest once its appropriate cDNA has been fused to the MS2 binding sites within this plasmid. Sometimes looking at a protein inside cells just isn’t enough to get all the information you need. If you want to dissect an individual protein’s function under a wide range of highly controlled conditions in vitro, or, if you want to determine its structure using X-Ray crystallography, you’ll likely need to purify it. Luckily, many proteins can be functionally expressed in bacteria under the proper conditions and, epitope tags can be used to simplify the purification process. Using plasmids in this collection, you can highly express your protein of interest in bacteria, add epitope tags to it, and, later, cleave those tags from the purified protein. Protein purification can be challenging, but once you get it right, you can learn many things about your protein’s function, structure, and interactions! pDEST-HisMBP 11085 Tac (lactose/IPTG inducible) MBP, 6x His David Waugh Empty lactose/IPTG inducible vector for expression of a recombinant protein with an N-terminal 6x His tag and an MBP tag. Compatible with Gateway cloning. pDEST-periHisMBP 11086 Tac (lactose/IPTG inducible) MBP, 6x His, signal sequence for localization to the periplasm David Waugh Empty lactose/IPTG inducible vector for expression of a recombinant protein with an N-terminal 6x His tag and an MBP tag. Contains a signal sequence to localize the protein of interest to the periplasm which may aid disulfide bond formation or prevent toxicity. Compatible with Gateway cloning. pGTvL1-SGC 39188 pTac (lactose/IPTG inducible) N terminal GST tag with TEV cleavage site to remove tag Nicola Burgess Brown pGEX expression vector with N-terminal GST tag and TEV cleavage site. Includes sites for LIC cloning, and a "stuffer" fragment that includes the SacB gene, allowing for negative selection on 5% sucrose. Other empty vectors for protein purification from the Structural Genomics Consortium and Nicola Burgess Brown containing a variety of tags can be found here. pNH-TrxT 26106 T7 LacO (lactose/IPTG inducible) N terminal, TEV cleavable 6x-His tag Ophear Gileadi pET-28-a based expression vector containing N-terminal, TEV cleavable, 6x-His and thioredoxin tags. Other empty vectors for protein purification from the Structural Genomics Consortium and Ophear Gileadi containing a variety of tags can be found here. pBAD LIC Series (8-Series) Various Plasmids pBAD (arabinose inducible, glucose repressible) His, Strep, mOCR, MBP, with and without SUMO or TEV cleavage sites to remove tags Scott Gradia Arabinose inducible vectors that come with various epitope tags useful for protein purification. pET LIC Series Various Plasmids T7-lacO (lactose/IPTG inducible) Flag, His, Strep, mOCR, MBP, GFP, with and without SUMO or TEV cleavage sites to remove tags. Scott Gradia Lactose/IPTG inducible vectors that come with various epitope tags useful for protein purification. pET15-MHL 26092 T7-lacO (lactose/PTG inducible) C-terminal TEV cleavable 6x His Cheryl Arrowsmith Empty lactose/IPTG inducible vector for high expression of a recombinant protein with a 6x His tag. Requires a strain with T7 RNA polymerase. Amp resistant. More expression vectors for protein purification from the Cheryl Arrowsmith can be found here. pTD Series Various Plasmids pTrc, hybrid of trp and lac promoters (Lactose/IPTG inducible) Various combinations of N and C-terminal Strep and His tags Thorben Dammeyer Lactose/IPTG inducible vectors with LacIq, a stronger repressor than LacI that lowers basal protein expression. Vectors come with and without different combinations of His and Strep tags as well as N-terminal PelB tags for localization to the periplasm. Series contains vectors with a YFP variant that functions in the periplasm and can be co-localized with the protein of interest. RK2 origin suitable for replication in many gram-negative hosts. pCri System Various Plasmids T7/lacO and lacO variants that can be expressed in B. subtilis Various combinations of N and C-terminal Strep, His, MBP, TRX, GST, SUMO, MISTIC, and LSL tags as well as tags for protein localization to aid disulfide bond formation F Xavier Gomis-Ruth Kit containing plasmids with a wide variety of N and C-terminal epitope tags, localization sequences, and cleavage sites that can be used to express a protein of interest in E. coli, B. subtilis and P. pastoris. All plasmids use the same restriction enzymes for cloning so multiple constructs can be made and tested at once. It isn’t always beneficial to constitutively express your gene of interest at high levels. Perhaps high expression leads to slow bacterial growth, or maybe you only want to study the effects of protein expression in stationary phase. In these cases you may want to control protein levels or to turn on expression only at a specific time. This collection has a variety of plasmids whose expression levels have been well studied or can be controlled by small molecules, light, temperature, or even intracellular metabolite levels. Different plasmids and, often times, different bacterial strains have different levels of precision in control of gene expression so be sure to try a few different systems with your gene/protein of interest. Murray Lab pBEST plasmids Various Plasmids pBAD, OR2-OR1-PR, pLtetO, pLlacO Arabinose, Anhydrotetracycline, lactose, IPTG Richard Murray Plasmids based off of pBESTluc from Promega. Contain a variety of inducible promoters, their associated transcription factors, and reporter genes. pCS-PesaRlux 47640 PesaR 3OC6HSL (Quorum sensing molecule) Cynthia Collins Contains luciferase inducible by the quorum sensing molecule, 3OC6HSL, from a promoter repressed by EsaR. Designed to be used with the pAC-EsaR Series. pAC-EsaR Series Various Plasmids pLac lactose/IPTG Cynthia Collins Lactose/IPTG inducible expression of EsaR, a transcription factor responsive to 3OC6HSL. EsaR derivatives found herein have different sensitivities to 3OC6HSL. The EsaR-responsive promoter can be found in pCS-PesaRlux controlling luciferase expression. pCW-LIC 26098 3x Tac promoter (hybrid of trp and lac promoters with higher expression upon induction) lactose/IPTG Cheryl Arrowsmith Empty lactose/IPTG inducible vector. pPro Series Various Plasmids pPrpB Propionate Jay Keasling Propionate inducible vectors with various resistances. Comprehensive multi-cloning site compatible with standard cloning using many different restriction enzymes. pPro24-gfp contains GFP but all others are empty. pdCas9-bacteria 44249 pTetO Anhydrotetracycline Stanley Qi Anhydrotetracycline inducible expression of catalytically inactive Cas9 (S. pyogenes) which can be combined with expression of a gRNA from a plasmid like pgRNA-bacteria to knock down endogenous gene expression. pDawn 43796 FixK2 Blue Light (470 nm) Andreas Moeglich Empty vector for blue light inducible expression of your protein of interest. pDusk 43795 pR_FixK2 Blue Light (470 nm) Andreas Moeglich Empty vector for blue light repressible expression of your protein of interest. pJT106b3 31393 Red light inducible inverter Red light (650 nm) Christopher Voigt When combined with pCph8 and pPLPCB(S), makes lacZ expression inducible by red light. pCph8 50552 pLtetO-1 Anhydrotetracycline Jeffrey Tabor Anhydrotetracycline inducible expression of red light responsive sensor protein, pCph8, to be used with pJT106b3 and pPLPCB(s). pJT118 31395 PcpcG2 Green Light (532 nm) Christopher Voigt When combined with pPLPCB(S), encodes a green light responsive sensor protein that activates expression of lacZ in response to green light. BIOFAB plasmid set 1000000037 N/A N/A Drew Endy This kit contains plasmids with various combinations of constituitive promoters and translation initiation elements that can be used to drive gene expression at a specific level. 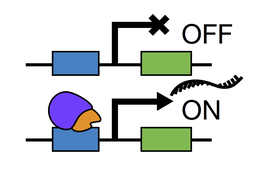 Reporter plasmids can be used to detect events and molecules in and around a bacterium. Plasmids containing easily measurable reporter genes (eg. LacZ or Fluorescent Proteins) under the control of a promoter element can be used to quickly determine whether or not a particular protein can activate expression from that element. When this activation requires a transcription factor to bind to a small molecule, the reporter plasmid can be used to detect the presence of that small molecule and sometimes even quantify it. Bacterial two-hybrid systems can be used to measure protein-protein interactions; if two proteins of interest interact in a bacterial two-hybrid assay, they activate expression of the reporter gene. pRU Series Various Plasmids Cloned by researcher Fluorescent protein, GUS, and LacZ Derivatives avaliable Philip Poole A family of promoter probe vectors incorporating fluorescent and chromogenic reporter proteins for studying gene expression in Gram-negative bacteria. pAK Series Various Plasmids pTac GFP, Luciferase (LuxCDABE) Attila Karsi Broad host range vectors for expressing luciferase and fluorescent protein reporter genes in Gram-negative bacteria. Hochschild Bacterial Two-Hybrid System Various Plasmids placO with lambda-C1 operator Beta-galactosidase Ann Hochschild Bacterial two-hybrid assay using pBRα-β flap, pACλCI-β-flap, or their derivatives. Binding between the RNAP subunit α fusion protein in pBRα-β flap and the λCI fusion protein in pACλCI-β-flap results in the activation of lacZ expression from FW102 OL2-62. Wolfe Bacterial One-Hybrid Series Various Plasmids Cloned by researcher Growth of strain USO hisB- pyrF- rpoZ- on plates lacking histidine and containing 3-AT Scot Wolfe Bacterial one-hybrid system for testing transcription factor binding to reporter plasmid pH3U3-zif268 (omega). Transcription factors are expressed from one of the pB1H2w derivatives as a fusion to RNA polymerase subunit ω. Transcription factor binding to a putative promoter region cloned into pH3U3-zif268 (omega) activates expression of ura3 and his3. In bacterial strain USO hisB- pyrF- rpoZ-, this promotes growth on plates lacking His and containing 3-AT. FLIParaF.Ec-250n 18855 N/A FRET between CFP and YFP Wolf Frommer Reporter for arabinose levels in bacteria. The presence of arabinose enhances the FRET signal from the CFP and YFP fluorophores linked by an arabinose binding protein (AraF) in the plasmid. Other similar reporters for detecting maltose can be found here. pAra Series Various Plasmids pBAD GFP Bryan Berger Reporter system for testing hetero- and homo-dimer formation. Proteins of interest are fused to AraC or a dominant negative AraC. Preferential association of AraC-fusion homodimers results in the activation of GFP expression from the araBAD promoter whereas heterodimer formation with dominant negative AraC decreases GFP expression. Zinc Finger Consortium: Modular Assembly Accessory Reagents Kit Various Plasmids Sequence chosen by researcher Beta-galactosidase Keith Joung Transcription factor testing: Kit contains five plasmids and one bacterial strain for performing a bacterial two-hybrid (B2H) screen of modularly assembled zinc fingers.